*This story has been updated since our original posting on May 26, 2015 to reflect accurate US patent holdings of Metaio GmbH and Osterhout Design Group. With the annual software developer conference Google I/O approaching next week, many in the wearable industry are wondering what place Glass will have on the agenda, and to what extent Google will continue to promote its augmented reality platform. Glass was not a main focus during the 2014 I/O conference, however, that may change this year as Google Glass officially became integrated as a division within Google this past January. Given the significant coverage of Glass in industry media and popular culture, Envision IP took a look at other large technology companies that may also be innovating in the augmented reality (AR) and head-mounted display (HMD) space. 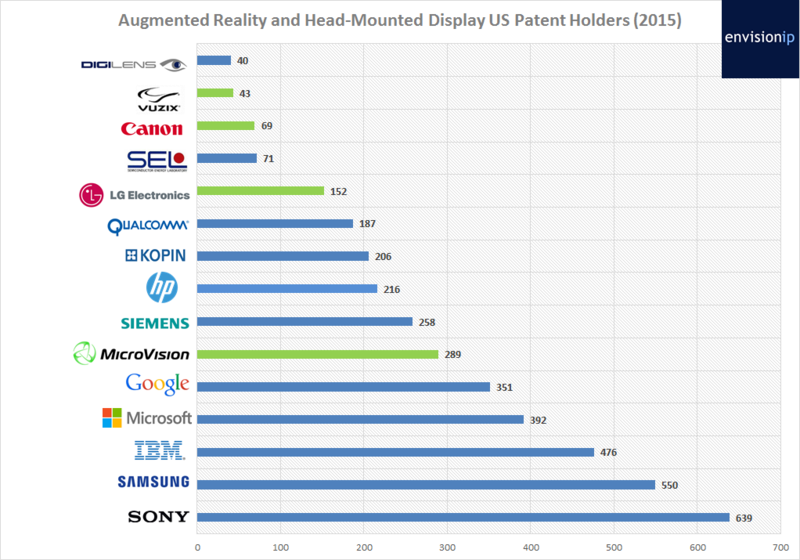 We previously reviewed the industry’s patent landscape in 2012, and since then, the AR and HMD market has certainly experienced widespread publicity, acquisitions, and growth. Presumably driven by an increased adoption of wearable devices in general, many technology companies, both large players and smaller new entrants, are developing glass-like and head-mounted devices, and related components and software, for consumer and enterprise use. We recently took another look at the companies that are actively patenting in this space, and identified over 7,900 US patents with claims related to AR and HMD platforms and devices. These patents cover a broad array of technologies specific to the augmented reality space, from display hardware and semiconductors, to software that drives image processing, network connectivity, and personalized content delivery. Sony topped our list as the largest US patent holder in this space, owning over 600 patents. Close behind is Samsung Electronics, which owns 550 US patents related to AR and HMD technologies. The next largest owners are IBM (476), Microsoft (392), and Google (351). Microvision Inc. made our list as the largest US patent holder in this space, owning 289 US patents primarily related to hardware components for augmented reality systems, with a focus on miniaturized MEMS and PICO level systems. Another smaller company is this space with significant patent protection is Kopin Corporation, with 206 relevant patents. Siemens, Hewlett-Packard, Qualcomm, LG Electronics, and Canon are large technology companies with significant patents in this space, while Digilens, Vuzix, and Semiconductor Energy Laboratory are smaller companies that also own sizable US patent portfolios related to AR and HMD. Other large companies which have a smaller number of issued US patents related to AR and HMD technology are Intel, Nokia, Apple, Sharp, Panasonic and GE, defense contractors Lockheed, Boeing, Rockwell Collins and Raytheon, automotive manufacturers Ford and Honda, and entertainment giant Disney. At a high level, it appears that broad commercial and enterprise-level applicability of AR and HMD technologies is allowing for industry-specific developments in this space. However, the large technology giants are not the only companies seeking a share of this emerging growth market. Germany-based Metaio GmbH develops software for various AR-related applications and products, and owns 171 worldwide patents and pending applications, with 25 issued US patents. Metaio was recently acquired by Apple this week. Osterhout Group is a designer and manufacturer of AR eyewear, and owns 81 worldwide patents and pending applications, with 10 US patents. Of the US patents, we identified seven which were assigned to Microsoft in 2014, likely part of Microsoft’s acquisition of Osterhout IP for a reported $150 million. Based on our analysis about 70% (~5,500) of the US patents in the AR and HMD space are owned by large-cap companies, leaving close to 2,400 patents assigned to smaller companies and individual inventors. This statistic in itself is important, as it shows development in this industry is not exclusively contained within large company R&D centers. Having a diverse group of global companies actively innovating in this space may ultimately lead to accelerated commercialization – hopefully (and ideally) resulting in a competitive AR and HMD marketplace with a wide array of products and features being available to consumers. *Our research is based specifically on augmented reality systems and associated head-mounted displays. We did not analyze virtual reality-related patents, as Google Glass is a see-through display that enhances a real-world scene, instead of an immersive virtual world system. Just today, Metaio seems to have shut down. On their website it says they no longer sell products and will only offer email support until the end of June. This is the most recent article on them. I was hoping to find out what happened. My assumption is that they no longer develop software, but only hold patents.